Quirky Queries 7: “Des Res” – what do you get for your money? The world of Basilica Fields is more than a railway… Basilica Fields includes and represents a part of the East End of London across a broad spectrum of geography, commerce, life… a window into a world that is beyond memory. Just the other day, probably sometime next week, a discussion took place about the interior of the late 19th century hovels which spread across the East End like jam on butter…. smeared onto the face of the world. Neither of the authors could recall much knowledge of how the rooms were arranged or the approximate sizes of the buildings which were “home” (or “Des Res”) to thousands of those who spent most if not all of their lives in the dismal sprawl of this part of London. So why were we discussing such a subject…. and how does that discussion relate to the Quirky corner of Basilica Fields? The sketches of the The Rookery and of Angel Yard depict row upon row upon row of dreary houses, many of those houses are not much better than slums and soon to be swept away. Those rows occupy a significant area of the proposed scenes and having dimensions of a representative, typical, building will be of great value when setting out the miniature real estate. In best Quirky tradition this post offers an opportunity for readers to help with some questions and thoughts. What might have been the size of a terraced house, for a labourer, in the East End? How many rooms downstairs and upstairs? What would be the size of the yard and how big might be the requisite out-house? Photos, drawings, pointers… what do you have that can help us in this quest? Great Eastern Railway Wagons. Part 1: Round-Ended Opens. Until the mid-1880s, the general merchandise wagons of the Great Eastern Railway had high rounded ends (‘half-moons’ in GE parlance) intended to help support sheets to protect goods in transit from inclement weather. Several thousand examples were built fr0m the 1850s (under the antecedent Eastern Counties Railways) onwards , and by 1878 accounted for 58% of stock owned by the GER. Number 9419, built during the period 1865 – 1875 is seen on a wet, foggy day in 1890. It has deep solebars and would either have been constructed with dead (dumb) buffers or the self-contained type seen here. The single-side brakes were fitted in the 1880s along with the Worsdell Type A grease axleboxes. Note the stencilled lettering. Over the years new batches were given progressively modern features which then cascaded down to earlier builds as they came into works for examination or repair. All were built with side doors, most had outside timber framing, and individual angle irons held the corners together. Later builds had conventional corner plates with the wooden timber framing, but the final batches incorporated outside iron diagonal bracing and knees to which the sides were secured. Early examples had no brakes until the 1870s when single-side wooden brakes with one lever acting on two wheels were introduced. These were gradually replaced from the mid-1880s onwards with iron brake blocks . During the 1870s self-contained sprung buffers gradually replaced dead buffers, but from the early 1880s standard short buffer guides were fitted to new builds. Both of these types were bolted to square wooden packing pieces to increase their length to 1′ 7″. From the early 1880s running efficiency was improved by fitting Worsdell’s Type A grease axleboxes. The livery was standard Great Eastern slate grey (Humbrol 67 or Phoenix Precision P.505 for modellers). 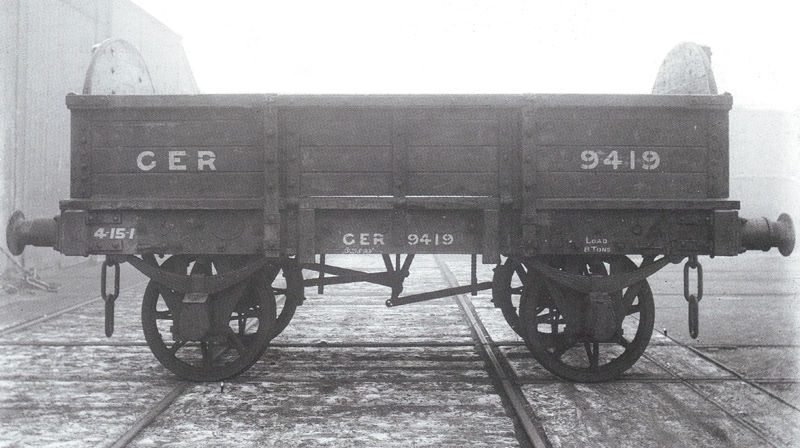 Lettering was hand painted in white but stencilled on older wagons as per the photographs. T. W. Worsdell oversaw the construction of the last 230 wagons. The final batches, ordered in 1883, called for 150 examples which were required for working over the new GN & GE Joint line. A new GA (available from the NRM) was prepared in the October of that year, and the wagons delivered during 1884. At the same time the design for a modern 4-plank open to supersede them was being prepared which will be described in the next instalment. At the end of 1901 there were still over 2000 of these wagons in stock, but with Holden’s policy of withdrawing all timber-framed wagons from revenue-earning service as non-diagrammed and obsolete, numbers diminished rapidly over the next decade and almost all had gone by 1910, though some remained in departmental service either in original form, or rebuilt for specific duties such as loco sand wagons. Proportionally speaking I ought to be looking to build about ten examples for Basilica Fields. Wagon no.13513 was built under Bromley, probably in 1881. 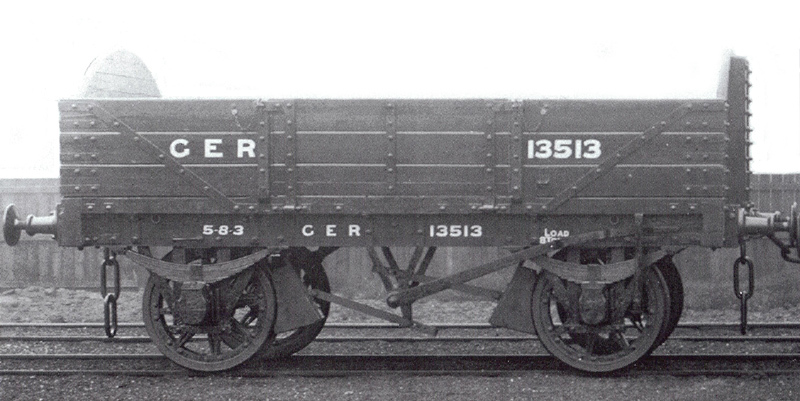 It exhibits some features carried over to the designs of modern wagons types which would be on the scene within three years, such as a 12″ deep solebar, outside iron side knees with diagonal bracing, and conventional sprung buffers – albeit with short guides mounted on 12″ square x 4″ wooded packing pieces. The single side brakes with wooden blocks date the wagon to the late Bromley period, but the photograph was probably taken in the late 1890s. The Worsdell Type A grease axleboxes and heavy duty springs are later additions, and one curious anomaly is the archaic use of individual angle irons instead of conventional corner plates which had been in use for a number of years prior to this build. The wagon has an unusual wheelbase of 9′ 1″, is 14′ 10½” over headstocks, 7′ 9″ wide, an internal depth of 2′ 3″ and is 3′ 8″ high over the ends. Note the hand lettering on this example and the built-up split-spoked wheels. Photograph © Public Domain. 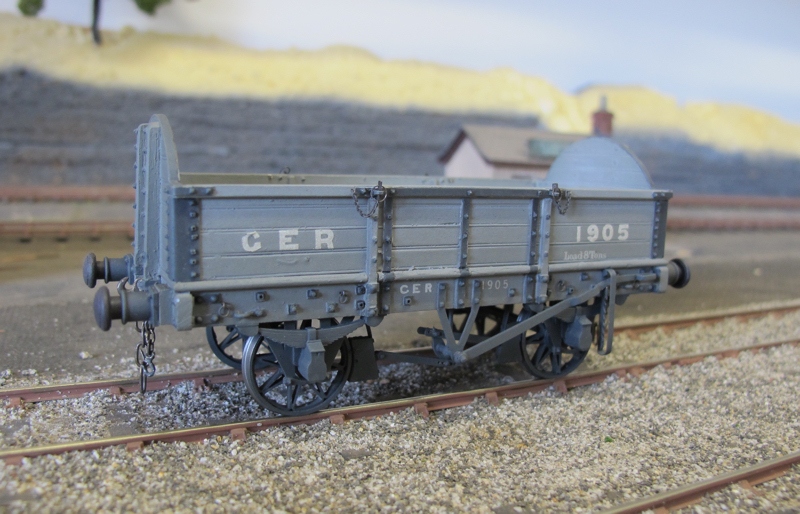 Richard Davidson forwarded me this photograph of his superb round-ended GER wagon in Scaleseven. As you can see, the delicate nature of the running gear on these early wagons is enhanced by the true-to-prototype gauge. I’m afraid the gap between updates has been longer than anticipated; for the first couple of weeks it was a simple case of lots of work and little free time, but the last couple of weeks or so I’ve been feeling pretty grotty. Now at last I’m slowly beginning to feel human again! Some answers to the questions on MICA liveries posed in the previous post are still being worked through so I’ll leave the next part of that series for the time being, at least until I have some firm data to share. This 3D model has prompted much badgering about information on the area around about the GE loco yard, dimensions of various bits of civil engineering and architecture and such like, so a new sketch of has been made and will be uploaded with some commentary soon. Just before turning a sickly shade of green around the gills I began to make some inroads into my Shelf Queens – half completed models intended for Basilica Fields. Construction on these models was put into abeyance for various reasons from insufficient prototype information to lack of parts, and all sorts of excuses in between. Once I’m up and running again I’ll be finishing some of these off, in particular those items of stock which have a direct relevance to the loco yard area. With that in mind, I’m starting a new series on GE open wagons which will begin in the next post. Much of the text for this series was drafted during long hours sat in hospital waiting rooms over the last couple of years, so it’s just a case of reigning in the verbose verbiage and rummaging through the endless photo albums for suitable piccies.